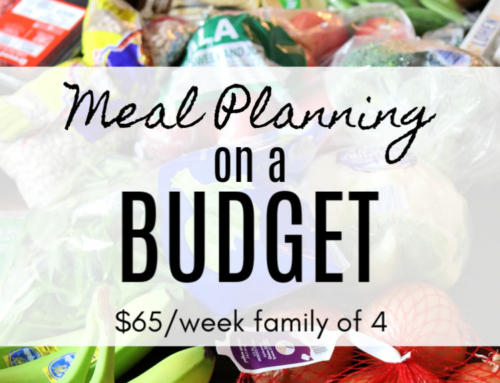 Budget meal planning for a family of four. 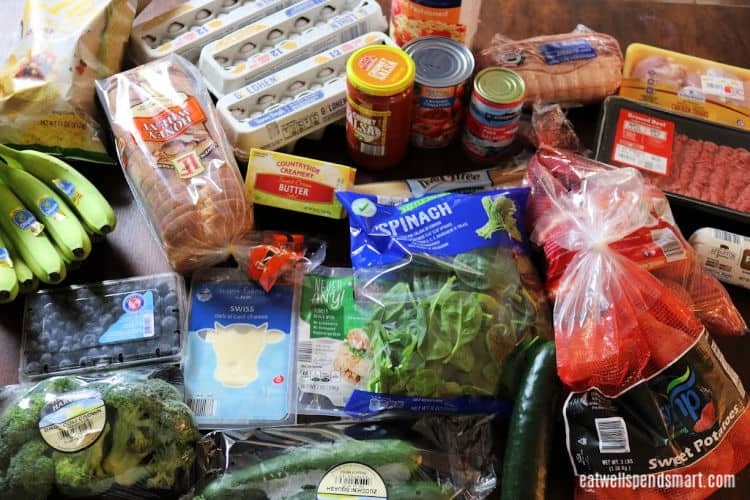 A week’s worth of food for $60 from Aldi including breakfasts, lunches, dinners, and snacks. 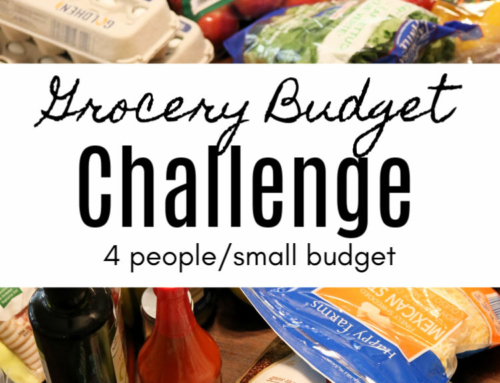 We are three weeks into our $60 grocery budget challenge. I am shocked at how quickly it is going! While it is going well, it is getting a little more difficult week after week because my staples are getting lower. 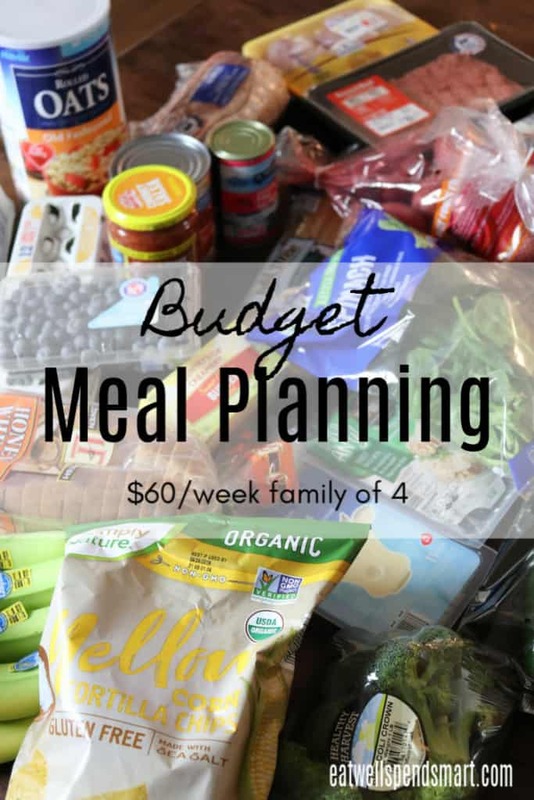 I am trying to add a couple of my staples every week so I don’t run out completely and bust my budget by restocking in future weeks. 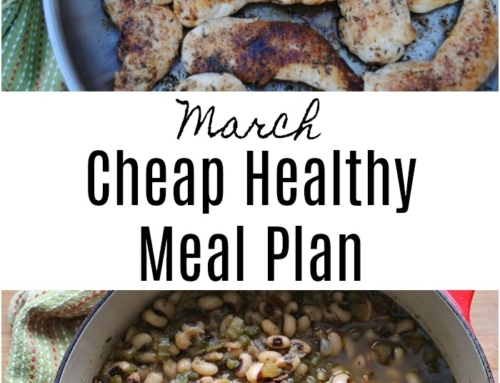 That defeats the purpose of my budget meal planning for the month of March. Just about all of my gluten-free flours are gone, so I am not able to do as much baking as I did in the previous weeks. Since that’s one thing Aldi does not carry, I’m going to look for sales at my other local grocery store so I can purchase them in upcoming weeks. 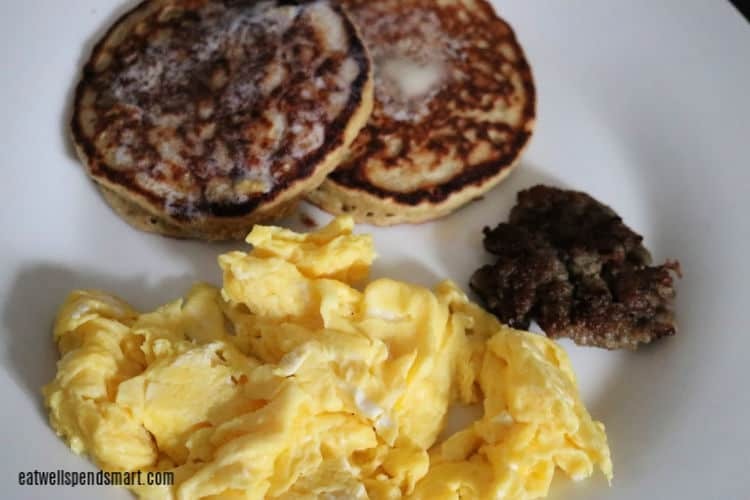 In the mean time, I am just cooking recipes that don’t require any special ingredients, which is a favorite allergy-friendly grocery budget tip of mine anyway. 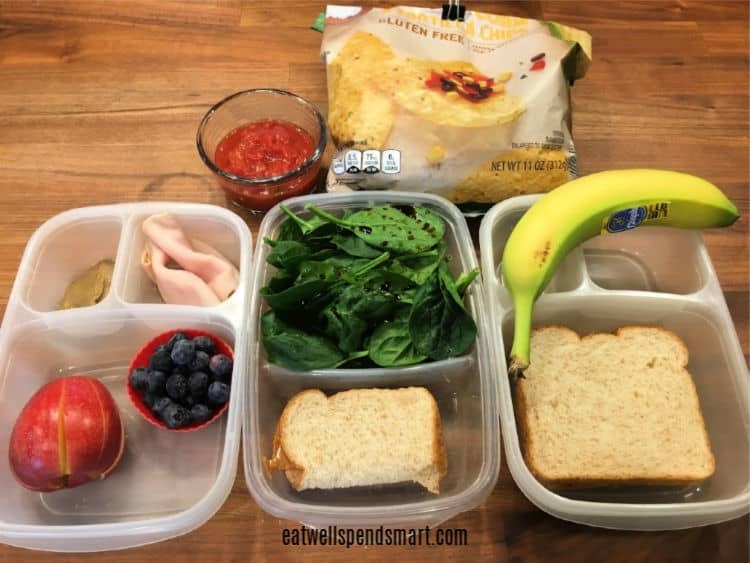 Last week we were needing another snack option, so I left a little more room in the budget for chips and salsa along with our other standby snacks. I did not prep any muffins or anything else and wished that I had. It really helps to do a little Sunday prep. Every week when planning, I keep several principles in mind. 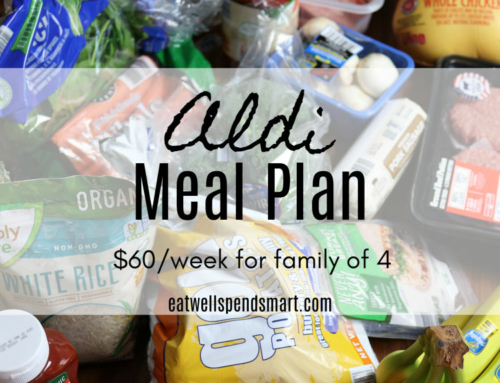 Take inventory of what you have and use it when meal planning. 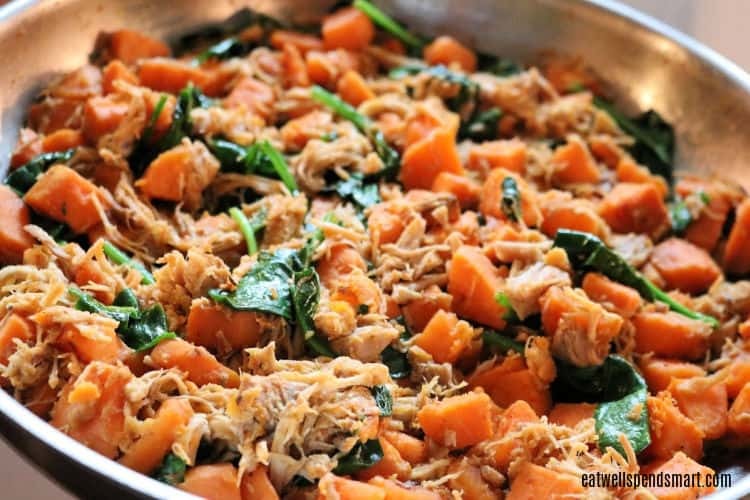 Stretch protein for multiple meals. Buy on sale produce and meat. 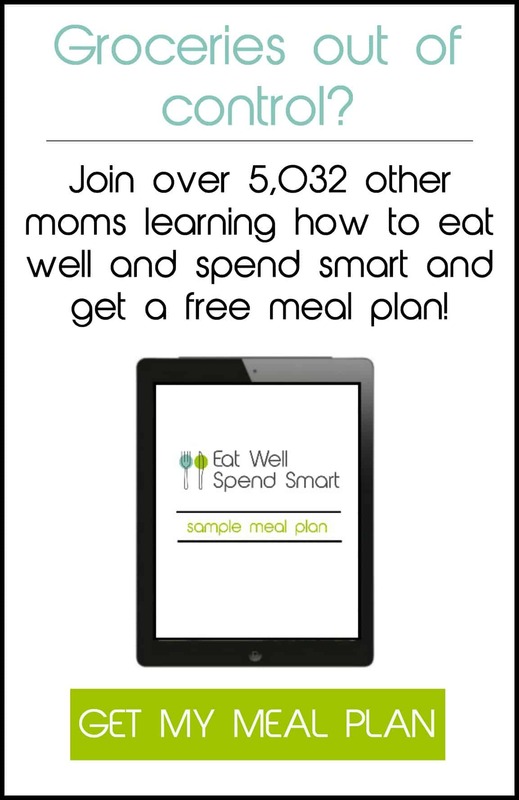 Rely heavily on inexpensive foods and stretch more expensive foods. Shop at Aldi when possible. 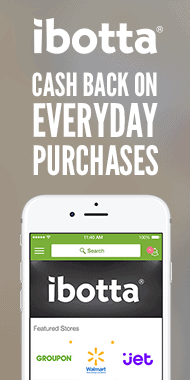 Buy just what you need and reduce waste. Again, I shopped at Aldi for all of my groceries. Below you will find what I bought and prices. Note: We also get local milk delivered, which was $3.50 for a half gallon. I don’t have a set plan for breakfasts. We eat what sounds good to us that morning. I make a big batch of oatmeal for my husband to reheat three days out of the week when he leaves for work early. The rest of the choices are below. I purposely stretch a roll of sausage for three breakfasts, which means the pieces are small and for each breakfast we each get 1-2 pieces. Along with other foods, it’s plenty. My kids are big eaters too. They can easily eat 2-3 pancakes, scrambled eggs and sausage all in the same meal. My husband takes a turkey sandwich with Swiss, raw vegetables and fruit at least 3 days a week. The other two he will take leftovers or a sandwich. The kids and I eat whatever sounds good to us that day. Below were options. Lunch to go for our outing to the caves. My daughter’s on the left, mine in the middle, and son’s on the right. We all shared the chips and salsa. I don’t have a picture of this night because we had small group at our house and ordered pizza and wings with a Papa John’s carryout special. This was paid for out of our church ministry budget. 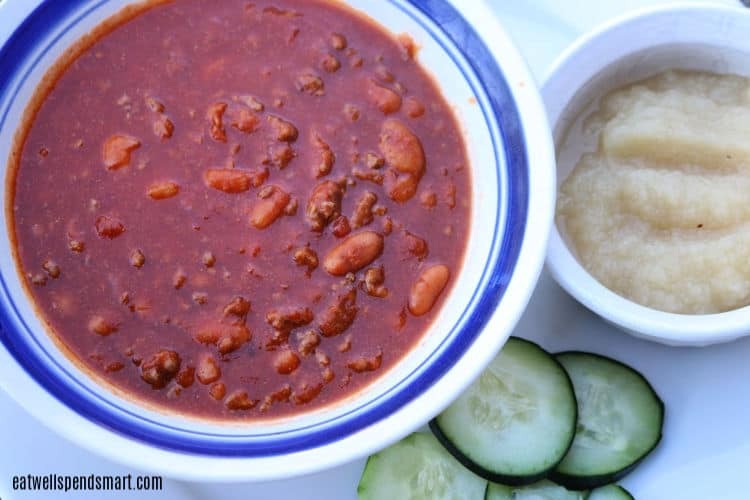 We had a big batch of chili and I served it with no-cook sides: cucumbers, applesauce, tortilla chips. I used dry pinto beans that I did not use last week instead of canned. I purposely saved leftovers for Tuesday night’s dinner and we did not use them for lunch on Tuesday. The kids and I took an excursion to a cave this day, so we were gone all day. I purposely planned a “no-brainer” meal for dinner. 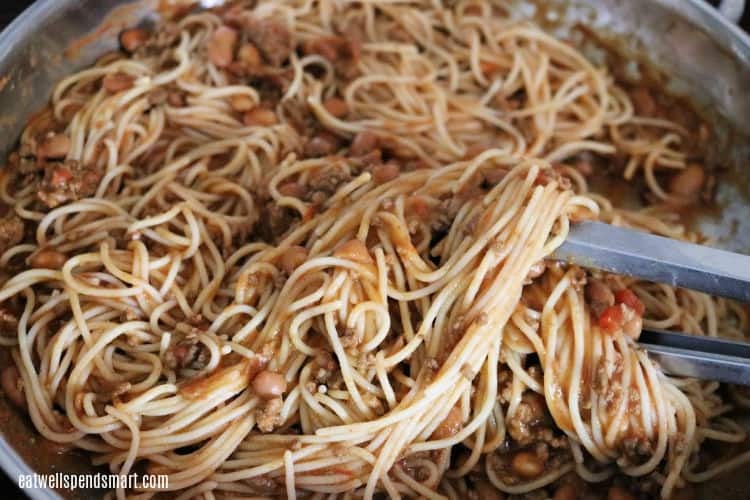 The chili leftovers were heated through and mixed with gluten-free rice pasta. I had to season it with a little extra salt, garlic, and chili powder as well as add a little water to thin the “sauce”. It was a quick and tasty dinner. 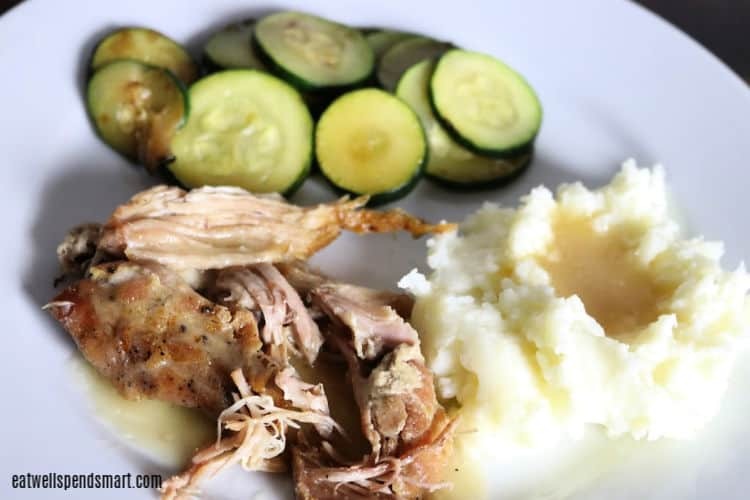 We were gone most of the day this day too and Wednesdays are always rushed with church, so I planned slow cooker pork roast that could cook all day while I was gone. I omitted the balsamic that I normally use because I wanted a more neutral flavor for the gravy and I wasn’t sure what I was going to do with the leftovers. When I got home it took me about 20 minutes to pull together mashed potatoes and sautéd zucchini as side dishes. The gravy was made with the drippings from the pork thickened with rice flour. It was “lick-the-plate” good. This is not one of my normal meals so I was winging it. The only thing I had planned was to do something with the leftover pork. Since it was a large roast, I had enough for lunch and dinner to use. First, I cooked a few small sweet potatoes in a large skillet. I ended up putting a little water in the pan so that the sweet potato would cook through. After it was soft, I added the pork and seasoned it with Cajun seasoning and salt. Once that was heated through, I added a couple of handfuls of spinach. I had my reservations on how the kids would like it, but they both happily ate everything, which I was pleasantly surprised about. Friday night is the night I’m always tempted to get takeout, so it takes a lot of willpower to power through. My husband helped me chop which gave me a little motivation burst since that was the hardest part of the entire meal. I made my simple grilled chicken thighs but cooked them in a skillet instead of grilling them. 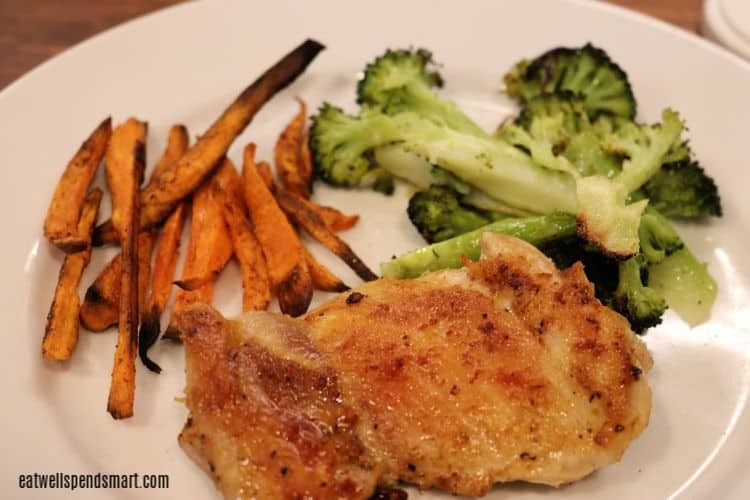 I served them with roasted broccoli and sweet potato fries that I borderline burned. Whoops! Friday is also typically a family movie or game night so I like to have a fun meal or a treat for us. 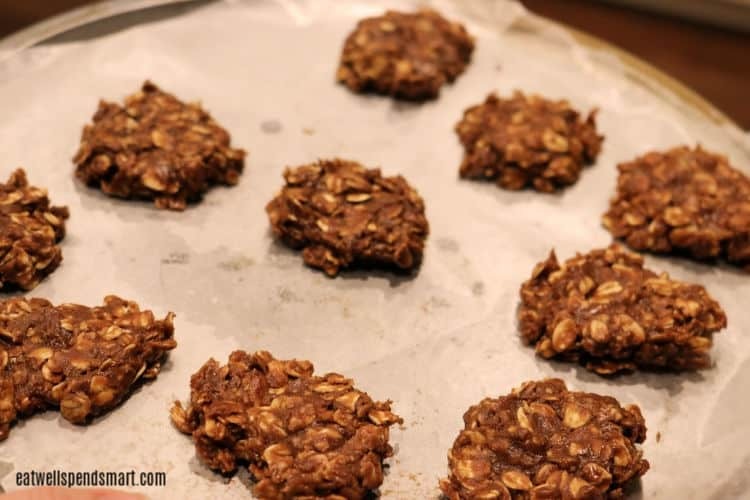 I dug deep and pulled together an adapted no-bake cookie recipe. I had to sub sunflower butter for peanut butter (allergies), water for milk (allergies), and a butter sub, but they turned out really yummy. 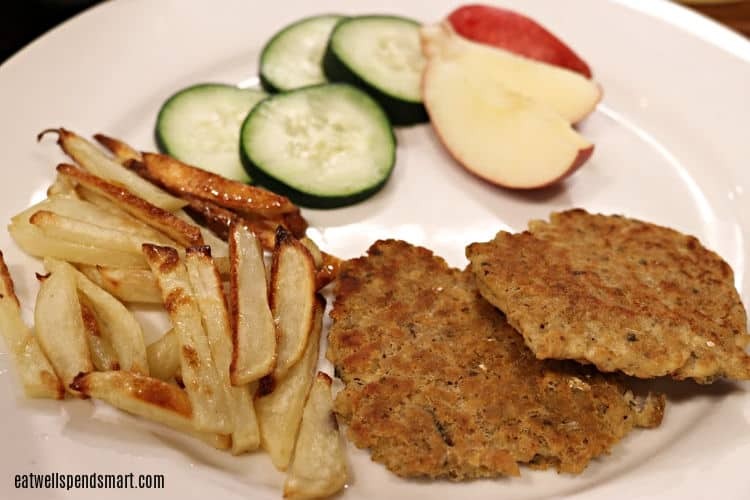 A simple dinner of salmon patties, oven fries, and the last of the apples and cucumber. It is always a bit shocking at the end of the week when my fridge is bare. Although it’s nice to be able to have a clean slate to make wiping down shelving easier, it’s a strange feeling having just enough. Necessity is definitely the mother of invention. Take for example the no bake cookies. I have never made them before, but when you are craving something a bit sweet and don’t have it in the budget to buy extras, you learn to make do with what you have. I am also finding that my pickier kid is becoming less picky, which is interesting. With fewer options, he is learning to eat and enjoy things that he normally overlooks. He has been eating more bananas and vegetables than before we started this challenge. I hope this continues once the challenge is over. One thing I wanted to address. Several people have sent me messages that they don’t have an Aldi and could never get these prices. I want to encourage you here. The $60 number is a number that made sense to me and my circumstances. Your circumstances may be totally different and that’s ok. Try not to get hung up on the number but instead the principles used. 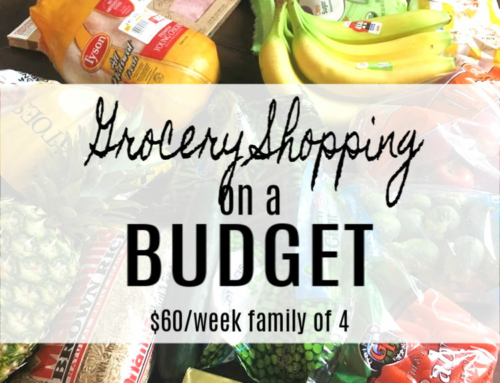 If you focus on the principles, you will see your grocery bill decrease. 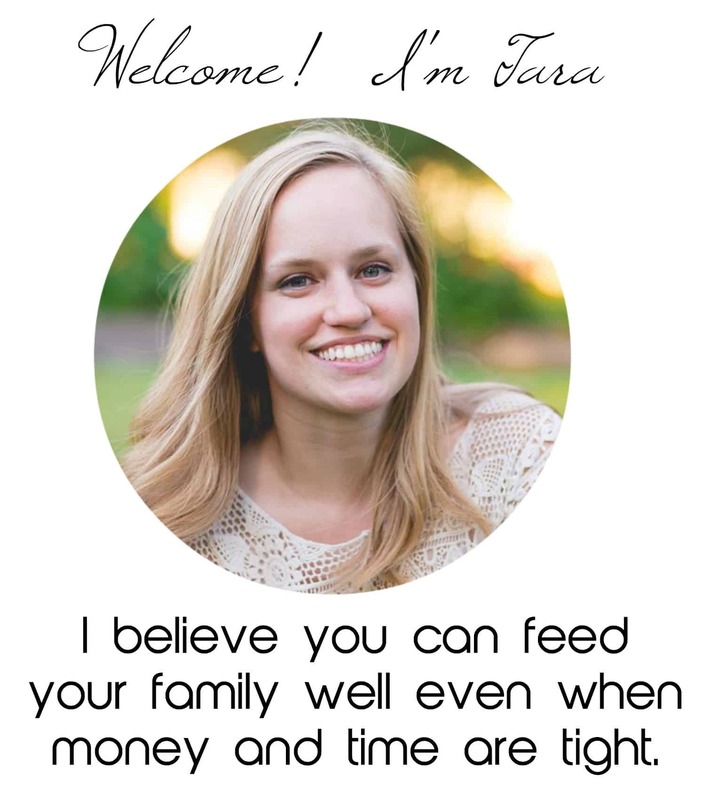 The budget principle “Embrace simple meals” reminds me of a scripture that really speaks to me. Acts 2:46b “…they ate their food with gladness and simplicity of heart.” This is my theme scripture for eating frugally. We don’t have to have fancy, expensive food to eat healthy and be happy.